Stainless steel shelving is a popular solutions for the NHS or environments where shelves need to be kept sterile and clean. 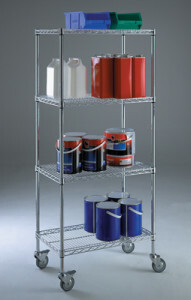 All of our stainless steel shelving and trolleys are manufactured in the UK using only quality stainless steal. We have been supplying stainless steel shelving and trolleys to the NSH for over a decade now. Click here to shop online for Stainless Steel Shelving. Or you can call us on 01937 585 057 so we can arrange a site visit to carry out a measurement survey, to make sure you get the best products for your requirements and budget.